You know what I'm talkin' 'bout. New shoes. I've been a Mizuno and Zoot (triathlon) girl for the longest. Wave Riders and TTs are all that I've worn for quite some time -- about five years, almost as long as I've been running. I gave the Brooks Ghost 7s a shot, and while they are ridiculously comfy WHILE running, they were not the right shoe for me. My leggies and Achilles began to ache after running in them, so I switched back to my regular rotation. The other day, I got a wild hair and ordered the Brooks PureFlow 4s. They're GORG. And no matter if the shoes are new with anticipation, new with familiarity, or just something bright and shiny, you know a certain feeling. It's giddy, it's anxious, it's excited, and happy. To the max sometimes. Also, I spy a running shirt that I wish had been available my entire running life. It's not brand new to Brooks; it's been around all summer. But for Heaven's sake, I had to look down several times to make sure it was still on. So cool...so comfy. My run today = aces. Albeit HOT. 3 X 1-minute planks after about ten minutes of good stretching. One last terrifically marvelous thing before I get serious (for only a second, promise!). In case you didn't know, Lolo Jones is my favorite human. She seriously makes my life. My *brain hug* is her Instagram. I'm really, really ready to get back into training. I was complaining whining explaining last week about how much I long for my life to be back to normal after a hectic schedule. Believe it or not, I'm ready to get back to teaching. I miss my P.E. gym. I miss my work husband. I miss my faculty and staff, and my administration. Most of all, I MISS MY STUDENTS. I've been Pinterest'ing (FOLLOW ME HERE!) like a mad woman with a ton of ideas for my new school year and my curriculum. I'm itching to get back into the swing of a regular work day, and I still have four weeks to go. *le sigh* I have to be patient and enjoy the break...life has its challenges. Running has taught me to be grateful for the joy and the pain, for being able to move, for being able to smile into the wind or sunshine, into the snow or rain, and for a feeling that I can't even describe...just happy. It has taught and continues to teach me to be patient; the things I want will not come overnight. --It gets me through the challenges, perhaps by presenting smaller, more intense challenges, and I am thankful for the hurdles. Also, you thought of this, didn't you? :) If you didn't, then you should have. EnJOY the rest of your Monday, friend!<3 Thanks to the gorgeous Katie for encouraging more marvelous in our Monday! I literally almost peed myself over your fan pic. No lie. Love getting new shoes! They're always so pretty and bouncy. Nothing better. :) Hope these last few days of being away from teaching go by fast so you can get back to your routine!! 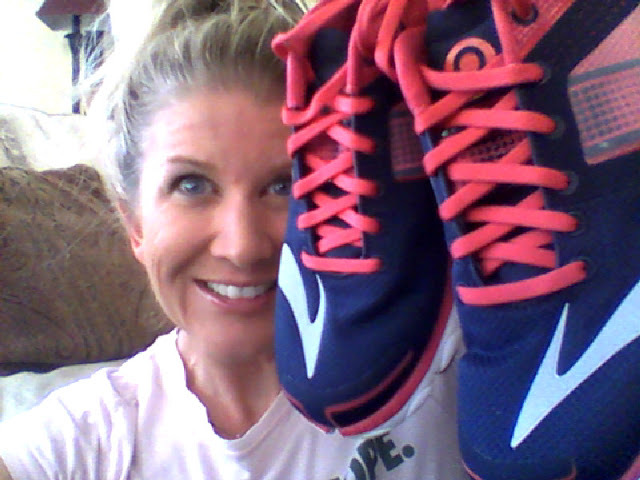 I am wearing Brooks Ghost now and am wondering if that is why I am achy in my calve muscle. I don't recall ever having such pains when wearing my Mizunos. I had similar issues. I think that the Ghosts were just too cushion-y. They felt AMAZING while I was running in them, like I was running on clouds. "Your running shoe should feel like an extension of your foot", I finally felt that with the Ghosts, but the aches that came with it (I'm assuming from muscles trying to compensate for the extra cloudiness) made it too difficult to carry on with them. I ordered a pair of the Launch 2 and the Pure Flow 4. I've run in the 2s and LOVED them so much. I got a pair of the 3s and like them but not as much as the 2s. I think I am due for a new pair because my feet and legs hurt a lot today. Then again it could be cause I ran 15 miles. I have the same shirt in all 4 colors. Best deal I found on the REI website. Pinterest is awesome! I've been on it too getting ideas for classroom organization and management.